In 2012, the Heritage Association joined with the Friends of the San Marcos Cemetery to organize a Cemetery Walk. The informative, inspiring and patriotic stroll through the historic San Marcos City Cemetery took place October 27, 2012, and featured the stories of more than a dozen veterans buried in the cemetery. After the success of the inaugural event, a committee including members of both organizations began in early 2013 to plan a second walk for November 2, focusing on the early settlers of San Marcos. In 2014, the walk was renamed "City Cemetery Tales and Tours." The event is usually held the third or fourth Saturday in October. About the San Marcos City Cemetery . . . The San Marcos City Cemetery, founded in 1876, is the burial ground for many Texas pioneers. Veterans buried here represent all wars dating back as far as the War of 1812. This is not the site of the city’s first cemetery, however. The original San Marcos Cemetery was located on Hutchison Street, where the former San Marcos Library building still stands at 310 W. Hutchison. The first burial in that location was in 1846, when the first Anglos began to settle near the San Marcos Springs. Within the next two years, the Texas Legislature organized Hays County and designated San Marcos as the county seat. By 1851, more settlers had arrived in the area, prompting landowners William Lindsey, Edward Burleson and Eli Merriman to make the layout of San Marcos official. It wasn’t long before the town outgrew the small cemetery and made plans to relocate. 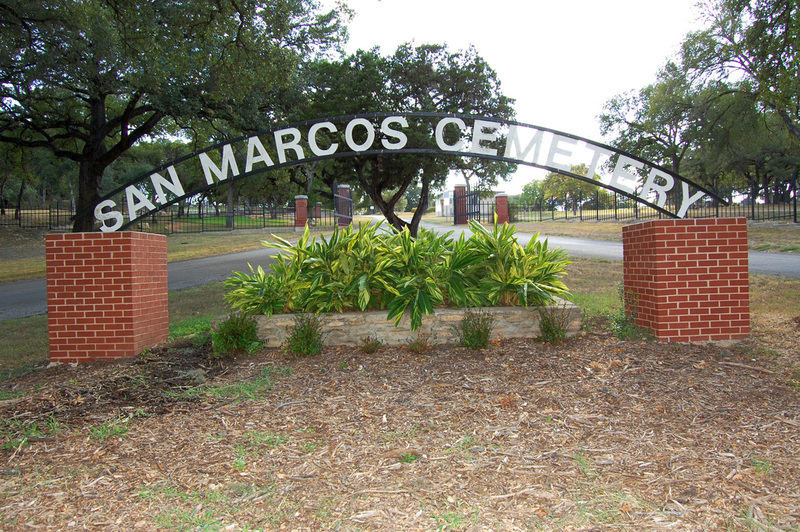 The San Marcos Cemetery Association purchased 10 acres on what was then known as the Blanco Road (now Ranch Road 12) and established the cemetery on that site in 1876. Many families transferred the bodies of their loved ones to the new cemetery, which explains why some inscriptions here predate 1876. The first recorded burial at the present site was Major C. Rogers in May 1876, although several early San Marcos settlers were buried in the northwestern part of the cemetery where they lie in unmarked graves. The outdoor chapel was built in 1886. The San Marcos Cemetery Association sold the cemetery and chapel to the city of San Marcos in 1924. Three additions to the property have been made over the years. This beautiful cemetery represents the final resting place for local residents of all races, religions and ethnicities. They include heroes and scoundrels; statesmen and college presidents; infants and centurions. Baptists, Catholics, Lutherans, Methodists, Presbyterians, Episcopalians and even a few atheists lie scattered over these hallowed grounds.